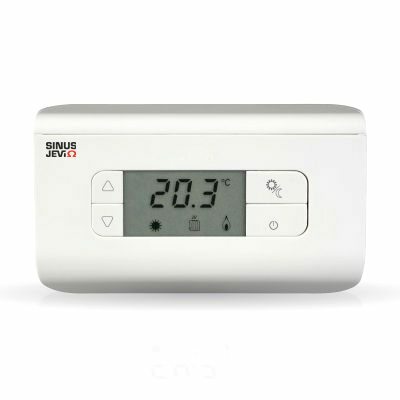 Sinus Jevi electronic thermostats offer ease of use, accuracy and enhanced switching capacity for direct electric heater control. 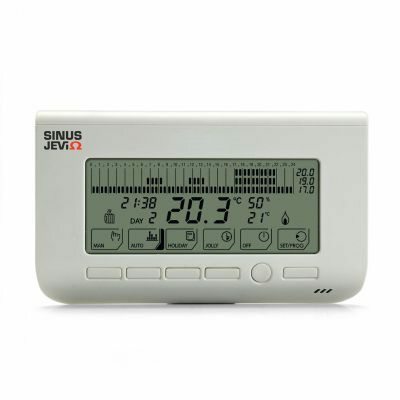 The LCD display shows the measured temperature and the status of the thermostat. The advanced (Chronothermostat) types show additional information like time, humidity and graphical symbols. The electronic thermostats are battery powered and are suitable for wall mounting or surface mounting on a conduit box. Electronic room thermostat with microprocessor to control heating and air conditioning installations. FC1A has the possibility to connect an auxiliary sensor for the minimum temperature T-min and the maximum temperature T-max. The output relay enables you to connect loads up to 16(4)A at 250 VAC directly to the thermostat. Thermostat type FC1C is similar to type FC1A except for the output circuit, which is wireless. The main advantage of this principle is the absence of external wiring at the thermostat. Mounting at virtually any location in the (heated) room is possible. The wireless relay receiver (switching unit, type FC3A) can be located nearby the heating source. Electronic chronothermostat with microprocessor and a programmable weekly (heating) control schedule. FC2A has a wide LCD display with graphic icons and 6 operating keys at the front. The thermostat has 3 side wheels for immediate setting of 3 scheduled temperature levels. Users are able to choose between 5 operation modes (manual, automatic, holiday, jolly and off) ) and many special functions, like proportional regulation, adjustable proportional range, optimization, etc. are available. Thermostat type FC2C is similar to type FC2A except for the output circuit, which is wireless. The main advantage of this principle is the absence of external wiring at the thermostat. Mounting at virtually any location in the (heated) room is possible. The wireless relay receiver (switching unit, type FC3B) can be located nearby the heating source. Electronic chronothermostat with user-friendly touch screen, microprocessor and a programmable weekly (heating) control schedule. 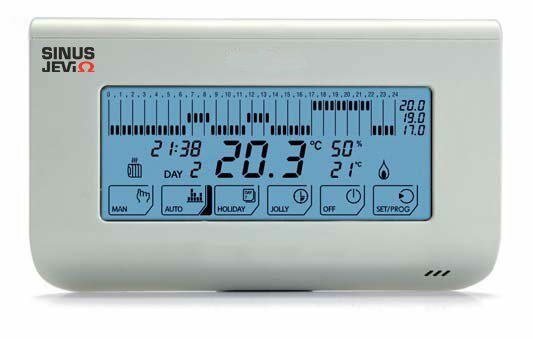 FC2D has a wide LCD display with back lighting and 6 graphic touch icons for quick access to the thermostat settings and functions. The thermostat has 3 side wheels for immediate setting of 3 scheduled temperature levels. Users are able to choose between 5 operation modes (manual, automatic, holiday, jolly and off) ) and many special functions, like proportional regulation, adjustable proportional range, optimization, etc. are available.